Last April, Oprah Winfrey brought daytime television viewers to tears with a heartbreaking exposé on puppy mills, breeding kennels that raise dogs in cramped, crude, filthy conditions. Dogs in puppy mills are constantly confined to small, filthy wooden crates or wire cages. They&apos;re deprived of exercise, socialization, adequate food and water, veterinary care, and attention. Many dogs are emaciated and sickly with crusty, oozing eyes, raging ear infections, swollen teats, gangrenous skin and/or abscessed feet. Some spin maniacally in their cages, cower in fear, or slump in severe depression. To get video footage, Oprah&apos;s correspondent Lisa Ling and Main Line Animal Rescue founder Bill Smith visited several mills in Lancaster County, Pa., the puppy-mill capital of the East. They went into one building that was full of cramped wooden crates stuffed with dogs. According to Ling, the spaces were so small that the mothers were stepping all over their babies. In another building, dogs were packed inside wire "rabbit cages" stacked to the ceiling; the dogs&apos; fur became soaked with urine and covered with feces from the dogs above them. Most dogs never leave their cages; they can barely walk. Some even have their vocal cords cut so they won&apos;t bark. In puppy mills, female dogs are typically bred during every heat cycle and most are auctioned off or killed when they can no longer produce puppies. According to Dr. Donald Allen, a veterinarian who worked on a Dateline NBC segment about puppy mills in April 2000, many puppies are sold before they are six weeks old, the federal age limit for interstate puppy sales. Premature weaning may make the puppies more susceptible to diseases, and because the puppies are often inbred, they may possess bad genetic traits or have extremely aggressive personalities. 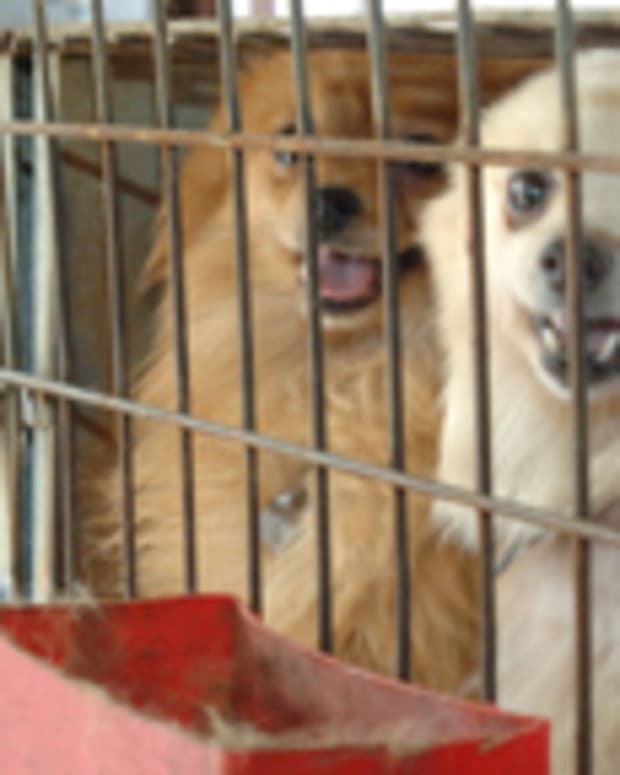 About 99 percent of pet stores in America obtain dogs from puppy mills. There are thousands of puppy breeders and dealers throughout the United States, ranging widely in size and production rates. Many puppy mills tend to be in the Midwest, although they can be found anywhere across the country (such as in Lancaster County, Pa.). The nation’s largest puppy broker is the Hunte Corporation in Missouri, which has been linked to numerous negligent pet stores and breeders. The U.S. Department of Agriculture is supposed to monitor and inspect kennels to ensure that they are not violating the housing standards of the Animal Welfare Act, but USDA inspectors are woefully few, and kennel inspections are a low priority. When violations are found, kennel operators are rarely fined, much less shut down. Each purchase of a pet shop pup lines the pockets of greedy mill operators and takes a home away from an animal dying for one at a shelter or breed rescue group. Between 6 million and 8 million animals enter U.S. shelters each year; half must be euthanized. Many - about 25 percent of dogs who enter shelters - are purebred. With so many animals dying for homes, it should be illegal to breed more dogs. Anyone who has the time, money, and patience to make a lifelong commitment to an animal should go to a shelter or contact a reputable breed rescue group, never a pet store or a breeder. Animals should always be spayed or neutered too. Spaying one female dog can prevent 67,000 births in six years, and spaying one female cat can prevent 420,000 births in seven years. For information on puppy mills and PETA&apos;s Animal Birth Control Campaign, see www.HelpingAnimals.com.